As someone who called Osaka home and considers themselves to be as Osakan as a foreigner can get both in manner and speech, I have of course been instilled with a love of takoyaki, those delectable fried doughy balls filled with octopus and topped with shaved bonito flakes. 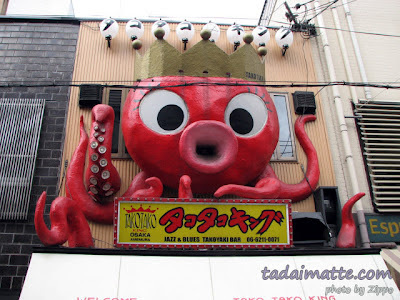 (Not everyone gets it - my boyfriend refers to this favourite as "tako-yucky.") It didn't help much that there was a tiny mom-and-pop shop 15 seconds from my front door, and the very first thing my co-workers did when they brought me to my apartment was set me up with ice cream and takoyaki from this place. Luckily, there are decent octopi offerings to be had here in Toronto, but I know I'm very lucky to have it. I'll almost always buy fresh takoyaki made from a restaurant before making it myself, since it's a lot of work! Just in case, though, I brought home my own takoyaki and okonomiyaki kits when I left Osaka, including picks, spatulas, mayonnaise container and even the electric grill. The Tako King is famous in Amemura, "American Village" in Osaka. Not everyone is so fortunate, of course, and at some point I'll have to replace some of my supplies. Locally, you can buy takoyaki and taiyaki grills and the flour at J-Town, but with none of the frills, of course. For those wanting something more high-tech, or living outside of the city, you may want to check out J-List's products for making affordable at-home takoyaki. 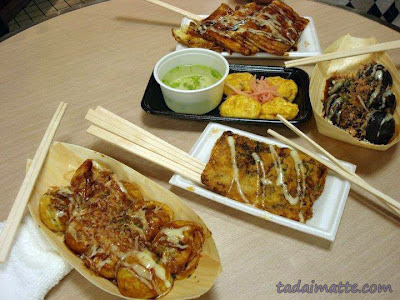 Seriously, everyone - takoyaki party. You won't regret it.